What kind of fitness data do we collect for Fly Movement? Utilizing the DHS Health Technology Platform allows us to track the number of moves each 3rd or 4th grader generates on a daily basis. The fitness trackers uses 3D accelerometer technology to track and record movements (or ‘moves’). On average, kids increase their moves 15-25% during the challenge portion of our program. During the course of the program, we report the kids’ movements in aggregate usually at the classroom level through our newsletter and social channels. Sometimes we do share who are the top movers for the week or the entire program. We do not share or sell the kids’ physical activity information to any other organizations or 3rd parties. It is only on a case by case basis and upon request by the teacher will we share the kids’ fitness activity on an individual level. In the past 30 days, has your child participated in at least 60 minutes of physical activity on at least one day? (doing any kind of physical activity that increased their heart rate and made them breathe hard some of the time). — Answer Yes or No. In the past 30 days, have at least 2 or more members of your family (including your child participating in the program) engaged in at least 60 minutes of physical activity on at least one day? (doing any kind of physical activity that increased their heart rate and made them breathe hard some of the time). — Answer Yes or No. Then, after the Fly Movement program has ended for 30 days, we redistribute the same survey. 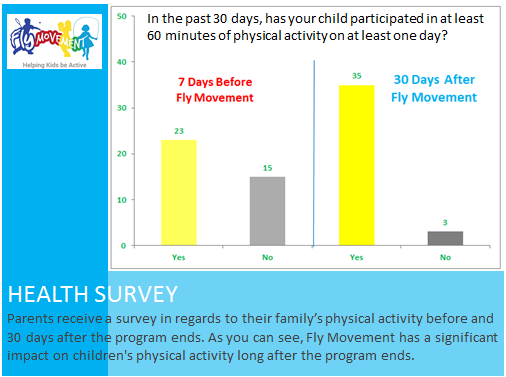 As you can see from the results of one of our programs, Fly Movement had a significant impact on children’s physical activity long after the program ended. Why do we ask these two questions? These questions are similar to health survey questions that the US Department of Health and Human Services uses. As a nerd who loves tracking data and measuring progress, I’m proud that Fly Movement is a kids health program that provides solid measurements and ROI analysis in addition to the qualitative feedback we receive from teachers and parents. Here’s a video of me talking about the pre & post surveys we send to parents of participating kids in our program. See behind the scenes details how Fly Movement works here.